Les Misérables may well be the longest 2½ hour film I have seen. Seriously – this thing goes on and on… but that’s not my point right now. Is it one of the best movies I’ve seen this year? No. Is it one of the worst movies I’ve seen this year? No. Is its interest level to audiences gobsmackingly subjective? Yes, of course. No one’s going to see a movie called Les Misérables unless they’re familiar with the musical, or even the 1862 Victor Hugo novel. Apparently extremely loyal to its source, the plot follows Jean Valjean (HUGH JACKMAN, who does an excellent job), a convict in the midst of the French Revolution, serving time for stealing a loaf of bread to support his sister and her children. After being granted parole by Javert (RUSSELL CROWE, who does a very good job acting wise but a merely passable job singing-wise), Valjean becomes a factory owner. Several years later, we are introduced to Fantine (ANNE HATHAWAY, who delivers an especially good performance), a factory worker who sells hair, teeth, and body to support her young daughter, Cosette (ISABELLE ALLEN in earlier scenes, AMANDA SEYFRIED in later scenes). She is very ill – Valjean sees her one night and takes her to a hospital before she dies. 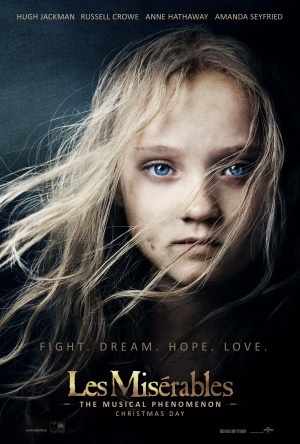 Then, another several years later, Cosette, now much older and adopted by Valjean, falls in love with a rebel, Marius (EDDIE REDMAYNE, who delivers a very good performance), but any type of optimistic ending is hopelessly stuck through the revolution, which affects all. Highly publicized through this film’s ad campaign was the feat that all singing was done live on set, as opposed to the typical route of earlier recording a song and lip-synching it while filming. While being toted around as “the first” to have done it, research revealed this has been done three times before in musicals, with At Long Last Love (Bogdanovich, 1975), The Fantasticks (Ritchie, 1995), and Hedwig and the Angry Inch (Mitchell, 2001). Still, Les Misérables is the first musical to have live singing done on this grand scale of production. Speaking of music, the movie, as you’ll know if you’re familiar with the musical, is nearly entirely sung through, which justifies the above method. The camera, whenever there is a song, will have the relentless ability to perform an extreme close-up on the actor singing at the moment – but this tactic only really worked twice (Hathaway’s spellbinding rendition of “I Dreamed a Dream”), and to a lesser extent, Redmayne’s “Empty Chairs at Empty Tables”). Regardless of its effect, thankfully no especially ugly people had to sing in this movie. And speaking of the cinematography, let’s talk about it. Resorting to either the above mentioned ECU, long crane shots (usually signaling a change in set year), and indirect shots through translucent curtains, nets, or prison-like bars, which give an onlooker type of angle, which is retired after the first third of the production. Also? Shaky handheld camera which is often turned into said close-up, or a Dutch angle. The camera work here is extraordinarily schizophrenic. A massive positive is the fantastic set and costume design which is quite apparent. Setting the mood well, detail is brilliant. The acting is covered in the plot, in a direct way. These are prime performances with actors to express great emotion and sorrow through their impressive singing. The musical, which has been running worldwide for over a quarter century, was composed first by Claude-Michel Schönberg and Alain Boubil, translated into English by Herbert Kretzmer. They returned to the film production to compose one new song – just one, for the movie. However, one can’t help feeling it was just so it was eligible for an Oscar for Best Original Song, another nomination in the swarms this one will probably receive come January 10. I’m going to end with a marginal recommendation for Tom Hooper’s latest production (Hooper also directed 2010’s Oscar-winning The King’s Speech). Actually, two separate recommendations. For fans of the musical, of which I probably made clear I am not familiar with, by all means, go out and see this. You’ll probably like it. For people who have no clue who any of the characters mentioned in the plot above, and are hopelessly confused by this review… well, I think Lincoln’s still playing.